The Admissions Office serves as the first point of contact for prospective students and those desiring more information about Southern Utah University. Complete information and applications are available online at www.suu.edu/admissions. This information is for students living in the United States and are not on a student visa. Information about international student applications is found in the International Affairs Policies and Procedures section. The following sections define the deadlines for applying for admission, the process by which admission is determined, and the standards that students must meet to be admitted. See below for a summary of admission requirements. Visit the Admissions Office’s website for a downloadable/printable copy of the Index: www.suu.edu/admissions/pdf/admission-index.pdf. Students who have graduated from an accredited high school and are under 24 years of age will be considered for admission based on cumulative unweighted high school GPA and test scores on either the ACT or SAT test. 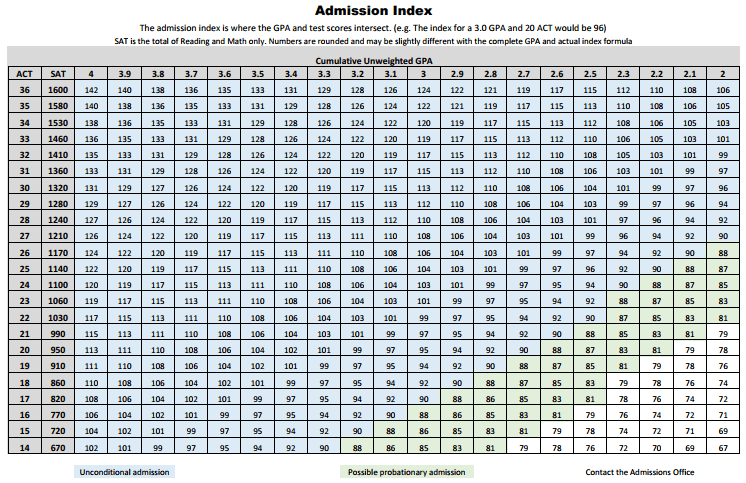 SUU’s admission index is used to determine admission. This index assigns more weight to high school grades than to test scores. For example, if a student’s GPA (grade point average) is a 3.0 on a 4-point scale, he/she is a likely candidate for admission. It is recommended, but not required, that students complete specific preparatory coursework in high school. Students who graduated from high school and are 24 or older and have not attended college after graduation will be considered for admission with at least a 2.0 cumulative high school GPA. (ACT/SAT scores are not required). Students who have completed the GED or HiSET tests will be considered for admission if the standard score average meets the minimum requirement. The average GED score must be at least 150 (450 if the GED was completed between 2002 and 2013 or 50 prior to January 2002) with minimum sub-scores of 145. The total HiSET score required for admission is 75 with a minimum individual score of 10. Students under age 24 must have an ACT or SAT that meets or exceeds the SUU average score and meet the minimum admission index. meet minimum prerequisites for each course. Concurrent enrollment students are not eligible for financial aid. A fee per credit hour will be charged for approved courses. Students taking classes on the SUU campus or courses not approved as part of the concurrent enrollment program will be charged regular undergraduate tuition and fees. Students may apply as an undergraduate student after high school graduation by submitting a completed admissions application, high school transcript, and ACT scores. Once admitted as an undergraduate student, students are eligible for financial aid and scholarships. provide written verification of graduation requirement completion from a high school administrator. High school seniors may take courses on the SUU campus or online from SUU faculty after meeting the criteria for concurrent enrollment. All early college students will be responsible for regular undergraduate tuition and fees. Special registration by sophomores and juniors may be approved by the SUU Registrar and/or Department Chair. Students who graduated from a home school program or an unaccredited high school and did not complete the GED or HiSET will be considered for admission with a transcript of courses that lists all courses studied and grades received and an ACT composite score that meets or exceeds the SUU average score. SAT Math and Reading scores will be converted to ACT equivalent and must meet the same requirement. Success Academy applicants are select students in grades 10-12 who have chosen to participate in the early college high school program with a major of associate of science in General Studies. Success Academy sophomores and juniors may take classes for SUU credit as concurrent enrollment students in the Success Academy classrooms. Seniors may take classes on the SUU campus as early college students with approval. Applicants must meet concurrent enrollment requirements. In addition, all course prerequisites must be met by the student before taking approved courses. Success Academy students are not eligible for financial aid. A fee per credit hour will be charged for approved courses. Students taking courses on campus will be responsible for tuition and fees. Students may apply as an undergraduate student after high school graduation by submitting a completed admissions application, high school transcript, and ACT scores. Once admitted as an undergraduate student, students are eligible for financial aid and scholarships. Non-degree seeking students desiring to take courses for continuing semesters must contact the Admissions Office each semester. Additional hours may be taken upon approval by the SUU Admissions Office. Applying for non-degree-seeking status is a convenient option for students applying for admission solely to take courses of interest. Credits earned as a non-degree-seeking student may be applied toward a degree at a later date. Non-degree-seeking students are not eligible to receive federal financial aid. Students who were dismissed from any college or university within the last semester are not eligible for non-degree-seeking status. Students are eligible for admission as transfer students with official college transcripts, high school transcripts, and ACT/SAT scores (if under age 24). A student who has previously attended SUU and has been away for two (2) semesters or more (summer not included) will be considered a returning student if he/she has not attended another college or university in the interim. Students who leave SUU and attend another college or university are considered transfer students. Returning students must have a previous cumulative SUU GPA of 2.0 or higher. Students who have been away from SUU for two or more semesters, or attended another institution, must submit an application for re-admission and pay the application fee. Returning students who left on probation and were gone for more than two semesters or were required to withdraw must submit a written request for readmission from the Academic Standards and Admissions Committee. Information is online at www.suu.edu/admissions/admission-review.html. If a student desires to obtain a second baccalaureate degree, he/she must submit an admission application and have a 2.0 GPA for admission. Once admitted, students are advised to meet with a Student Success Advisor or the department chair of his/her major to determine course requirements. Students who have earned fewer than 24 post-high school transferable credits will be considered for admission on the basis of their transcript of college work from all schools attended, their high school transcript or GED/HiSET scores, and ACT/SAT scores. Students who have earned 24 or more post-high school transferable credits will be considered for admission on the basis of their college transcript(s) from all schools attended. Students will be considered for admission if they were in good academic standing at the last institution attended and have a combined cumulative GPA (grade point average) of 2.0 for all colleges and universities attended. All courses taken at other schools will be transferred to SUU. Applicants who have a GPA of less than 2.0 may be denied admission. Appeals of the denial may be made in writing to the Academic Standards and Admissions Committee and submitted via email to the Admissions Office. Information may be found online at www.suu.edu/admissions/admission-review.html. For students dismissed from a college or university for cause, admission is unlikely, but will be considered on a case-by-case basis by the Academic Standards and Admissions Committee. Contact the Admissions Office for more information. Information is also online at www.suu.edu/admissions/admission-review.html. Once students are admitted, students will receive notice of their admission status by mail and email. Students whose admissions index is less than 90 may be considered for admission to the College Connections program. During their first semester, students take a specialized section of College Student Success (UNIV 1050), a course that provides new students with an extended orientation to the academic expectations and demands of higher education. Students are admitted on probation for one year and must pass UNIV 1050 with a minimum grade of “C” and achieve a minimum cumulative GPA of 2.0 for their first year in order to continue as an SUU student. Applicants may file appeals for special consideration if unusual or extenuating circumstances prevent an applicant from meeting the minimum admission standards or the application deadline. Appeals for new or returning students must be received no later than one week prior to the start of the semester. To file an appeal, contact the Admissions Office. Information may be found online at www.suu.edu/admissions/admission-review.html. Students who transfer with less than a 2.0 cumulative GPA may be admitted on a probationary status by the Academic Standards and Admissions Committee as indicated in the Appeals section above. Probationary status requires that students attain a minimum 2.0 grade point average in the first semester at SUU. The student attended SUU and left the university on academic probation or was required to withdraw. To apply for undergraduate admission, students must submit all materials indicated in the appropriate list below to the Admissions Office. The application and fee may be submitted on the web at www.suu.edu/apply. High school seniors and juniors may take courses on a high school campus or on the SUU campus (sophomores by exception). First-time, Full-time Freshmen Students graduating from high school and have not attended a college or university after graduation. Students are encouraged to plan early to apply to Southern Utah University. Application materials may be submitted at any time before the start of the semester. Students who apply early are more likely to secure an early registration time and a seat in their desired courses. (See Registration Policies and Procedures .) Applications for admission completed before scholarship deadlines are automatically considered for academic and general scholarships. Scholarship deadlines are posted online at www.suu.edu/finaid/scholarships.html. Additional documents as listed online at www.suu.edu/graduatestudies or on the program information page. Prospective graduate students should review the department website of their intended academic plan to determine if additional admissions requirements are necessary at www.suu.edu/graduatestudies. Graduate Assistantships are available in limited number in nearly all graduate programs. Students applying for or participating in a graduate assistantship must meet or exceed all criteria for entering the program, maintain graduate status, and make satisfactory progress toward the degree. Information on graduate assistantships is available from deans or coordinators of graduate programs. For questions about these policies, contact the Admissions Office at SUU at admissions@suu.edu or (435) 586-7740.